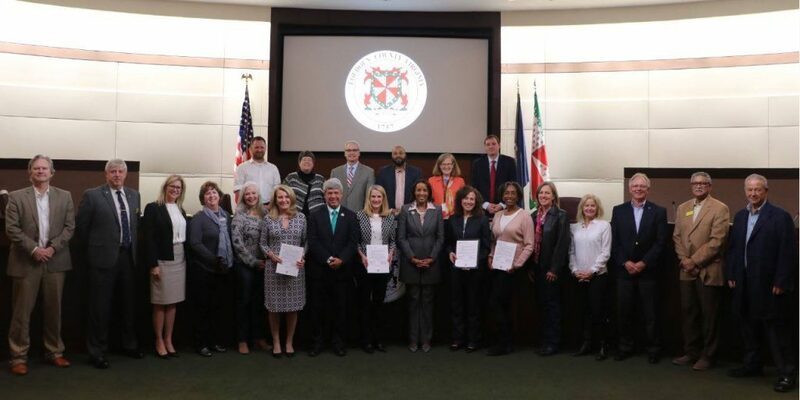 Members of the Dulles Area Association of REALTORS® (DAAR) advocated for a Resolution to commemorate the 50th Anniversary of the Fair Housing Act of 1968. 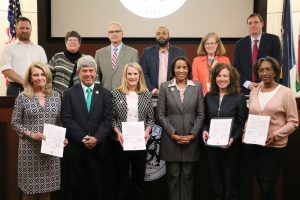 On April 3, 2018, the Loudoun County Board of Supervisors presented the Fair Housing Resolution to DAAR President Holly Weatherwax, President-Elect Phyllis Stakem, CEO Christine Windle, and Government Affairs Manager Brenda Morton. NOW THEREFORE BE IT RESOLVED that the Loudoun County Board of Supervisors recognize the 50th Anniversary of the Fair Housing Act and thank the many people and organizations in our communities who have opened the doors of housing opportunity to all citizens. DAAR members appreciate the support of the Loudoun County Board of Supervisors. L-R Front: Lars Henriksen, Barry Taylor, Lee McGinnis, Chris Covey, Gwen Pangle, Phyllis Stakem, Supervisor Buona, Holly Weatherwax, Chair Randall, Christine Windle, Brenda Morton, Karen Lilly, Kathryn Sink, Randy Sink, Dwight Brooks, and Jim Stakem. L-R Rear: Supervisors Buffington, Volpe, Higgins, Saines, Unstattd, and Letourneau. DAAR will publish more information about the Fair Housing Act during April. Visit www.dullesarea.com for recent posts. Contact Brenda Morton, Government Affairs and Communications Manager, at (703) 777-2468 or bmorton@dullesarea.com.